Going to Hacking Health was one of the best experiences I’ve had in recent memory. It opened my eyes to the world of entrepreneurship, and I’ve been in the startup world ever since. Before going to Hacking Health, I was a student at St. Clair College in Web Development and working part-time at Best Buy. I had no interest in business or entrepreneurship and thought that I wanted to be a designer in a big company. I had heard of Hacking Health from my professors at the college, but it didn’t sound that interesting because I didn’t think that I had any good ideas for healthcare or had a skill set that would be useful to anyone in the competition. I was at my part-time job one day when I ran into Irek, whom I had never met before. He asked me what I was in school for, and when I told him Web Development, he said that I should come to Hacking Health and gave me his business card. A few weeks later my professor mentioned it again and encouraged me to go, and I was convinced. The first day of Hacking Health, I had no idea what to expect. When I arrived, I saw a large group of people who I didn’t know. The organizers said that the people in the group who had ideas for the hackathon would get 30 seconds to pitch their idea to the group, in the hopes of getting people to join their team. I was sitting in the crowd when Dr. Michael Lanham came up to pitch his idea. He explained that a lot of the Fertility clinics in the US give out-of-date paper information to patients, which goes out of date soon after they get it. This leads to patients making mistakes with their medication that could have been avoided. He suggested making an electronic tool that clinics could use to send patients the information they need and keep it up to date, so it’s always accurate – making it far less likely that patients could make a mistake. I loved the idea, and after the pitches, I went and joined his team. Our team worked together over the next two days, and I ended up making the design of the app. We pitched on the final day, and ended up winning two awards! 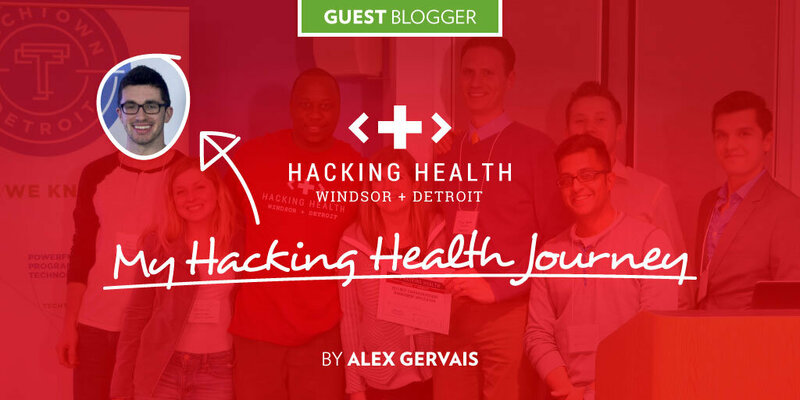 Alex Gervais (left) and the team from OnTrack IVF, winners of 2 awards at the inaugural Hacking Health Windsor + Detroit event in 2015. A few months later, Dr. Lanham approached me and offered me a full-time position at the University of Michigan to work on the idea. We later founded a company together called OnTrackIVF, with the goal of using the software we’re creating to make a positive change in the way fertility clinics communicate with patients. So I ended up getting a dream job of being a UX designer at the University of Michigan while I was still in school, and continue to work there today. Hacking Health was an amazing experience. I had the chance to meet a lot of great people and work on an exciting idea that is giving real people a better, safer healthcare experience. I strongly encourage anyone to go; everyone brings something to the table even if you’re not sure what it is. Making the healthcare system better is easier when we have people with a diverse set of skills working on problems together. Alex Gervais is UX/UI Designer & Full Stack Web Developer at the University of Michigan, Designer & Co-Founder of OnTrack IVF and Hacking Health Windsor + Detroit award winner. 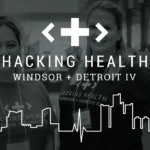 Hacking Health Windsor + Detroit returns for Year 4 April 13th + 14th. Join us!